I was out in the vegetable garden the other day and noticed that none of our Broccoli or other cabbage-type plants have any insect damage at all. Apparently the weather conditions have not been very good for the Cabbage Looper or other cabbage pests which is very good news for the Broccoli plants. I did happen to spot the first Cabbage butterfly in our garden on Tuesday. This is the culprit that lays the eggs that develops into those destructive cabbage worms. She and her sisters were not on the Broccoli just yet. I caught them feeding on nectar from our Salvia flowers. Here she alighted on a Hydrangea leaf just long enough for me to get this long distance snapshot. Notice the distinguishing characteristics: all white with a dark spot on each wing. You often see them in small groups fluttering about in the garden. If you see them landing on your cabbage and related plants, I guarantee that eggs are being laid and those destructive worms will start munching on your plants real soon. You can deal with these insects in a couple of non-chemical ways. First you can cover your plants with a thin garden cloth called “floating row covers”, this will keep the butterflies from even reaching your plants in the first place, so no eggs will be laid on the leaves. The other way is to spray the plants with a biological based material called BT. BT will not kill the butterflies, but will kill the worms as they begin to feed. Check at the garden centers for these products. There are still a few Cottonwood seeds floating around today. I think this is just about the end of them for this year. It apparently has been a great year for Cottonwood seed production. The seed crop was the biggest I have ever seen. Look at the seeds on this tree, the masses of seeds are as big as pie plates! 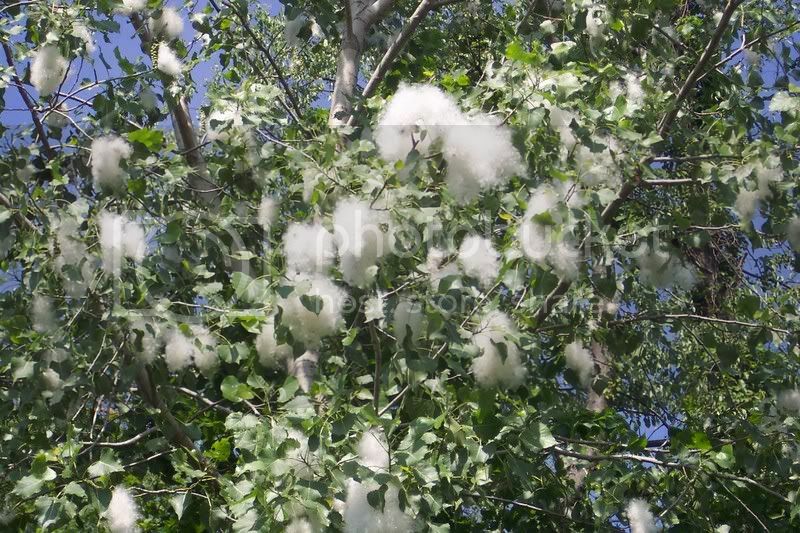 We didn’t get to enjoy all the floating cotton as much because of all of the high winds we experienced during the peak of Cottonwood season. I actually enjoy watching Cottonwood seeds float by… there is something soothing about it. Yes, they can collect in piles at times. This seems to upset some people, especially the “neat nicks” among us. To me, it’s a reminder of when I was a child. Those floaters meant we were really in summer and school wouldn’t be starting for a long, long time. With all of the hustle and bustle of planting 1000′s of flowers and vegetables these past couple of weeks, I almost missed the show that my Passion Flower was putting on. I planted this from seed about three years ago, this is the first time it has flowered. 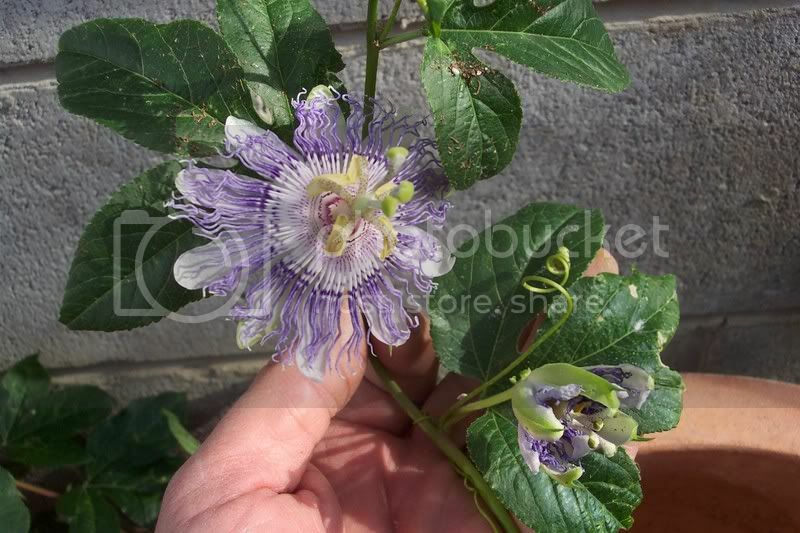 There are three Passion Flower plants in the green house. The actual flowers themselves are borne on a vine. Each flower seems to last a day or so then another takes its place. As you can see, they are very impressive, complex-looking blossoms. These are the same plants that produce Passion fruit, which is used by some people as a mild, fruity tranquilizer. Even though they look very exotic to us northerners, they grow wild mostly in the southeast states and South America. There are some species that are hardy enough to grow as far north as Tennessee and southern Pennsylvania. I don’t know what variety I have. For those folks in the south this all may seem mundane, but up here in Michigan…it’s a heck of a lot of fun! Over the weekend I needed to harvest a large bag of spinach. There were two ways I could have done this, either pull the entire plant out by the root or pinch off leaves one at a time. I prefer using the second method. This allows the plant to keep producing if the growing conditions are right. The problem was that I had injured my hand a couple of weeks ago and the pinching motion really hurt my finger. Using a pair of scissors could have been used, but then I would have needed two hands… one to snip the leaf and the other to hold it and put it in the bag. It came to me out of the blue… there was a way I could snip the spinach leaf and pop it into the bag all with one hand in one smooth motion, I would just use my Fiskars that I normally use for cutting flowers. This handy little tool resembles a pair of scissors. 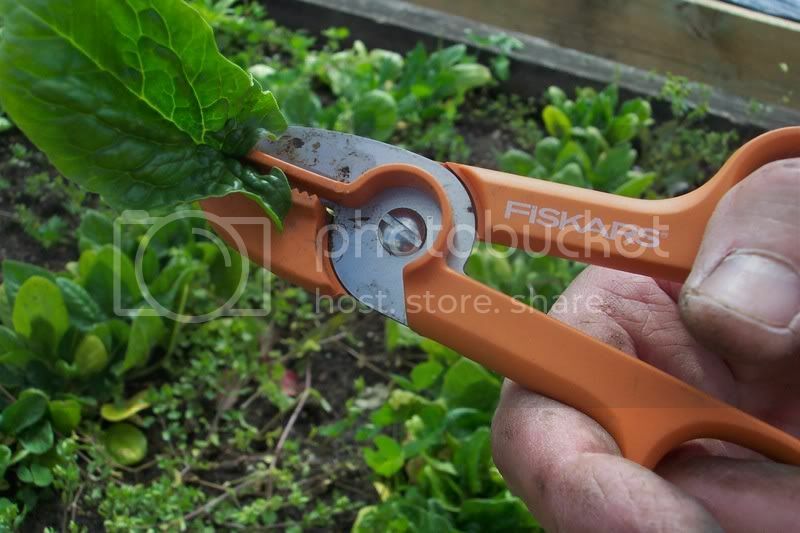 It has a cutting blade and a springy clamp that gently holds the stem of the flower you are cutting. This allows you to reach into a bed to cut a flower with only one hand. I found out it works just as well on Spinach!